The Graphing & List Window offers a convenient graphing tool that's able to plot two functions simultaneously and perform numerical calculus. Select Function Graph from the window's Graph menu to show the function grapher, as shown below. Operators: ^, +, -, *, /, %, ! Type in your function into the input box using "x" as the variable. Specify the x-value range and hit return or click Enter. The input expression is not case sensitive. See right for a list of supported functions. The maximum graphing numerical range is for either x or y is [-1E100, +1E100]. Complex numbers are not supported in graphing. If you wish to plot two functions simultaneously, rather than hitting return, designate your input as plot "A" or "B" by clicking the drop-down option next to the Enter button. See below. You can also use the Axes menu to show logarithmic axes or to map your plot on to a polar grid. Additionally, you may use the parametric variable "t" in your input expression in place of "x". In this case, DreamCalc will render a polar plot, although the polar grid will not be shown unless selected from the Axes menu. See the page on polar plots for more information. The Function Graph has it's own angle mode, as indicated by the radio buttons in the top right of the window. This angle mode is independent of the calculator's main angle mode. It defines the operation of the trigonometric functions when the function plot is created. After changing the angle mode, you must re-input your function by clicking Enter. Prior to plotting your function, you should specify the desired range of x using the MIN/MAX range edit boxes. You may use simple expressions in the range boxes, such as: "0.86 * PI". Alternatively, you may specify the range as part of the function input string itself — using square brackets and a semi-colon " ; " as the separator. DreamCalc will strip off the range values and fill out the range boxes for you when the function is entered. You must, however, specify the interval separately in the Interval or No. Points edit box (see right). Allows you to specify the number of points, where the corresponding interval will be calculated automatically. Generally this option is more convenient, as you do not have to re-define the interval for every function plot. 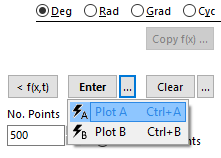 However, it doesn't offer precise control of the values generated as x-inputs to your plot. Allows you to specify an interval, giving you precise control over the x values used as input to your expression. For example, if your range is [0; 10] and you specify an interval value of 1, points will be generated at integers x = 0, 1, 2, 3... up to and including 10, or eleven points in total. If your input range and interval define a number of points greater than the maximum number of permissible points, the interval will be adjusted so as to limit the number of points. When copying to the X-Y list, any data already there will be overwritten. If no plot could be generated, an applicable error will be shown in the graphing display area. A plot will be generated, however, if two or more y-value results were successfully calculated over the input range — even if many other points could not be determined. Often this is to be expected from the nature of the input; for example, no X-Y point will be plotted for the input expression "1 / x" at x=0. 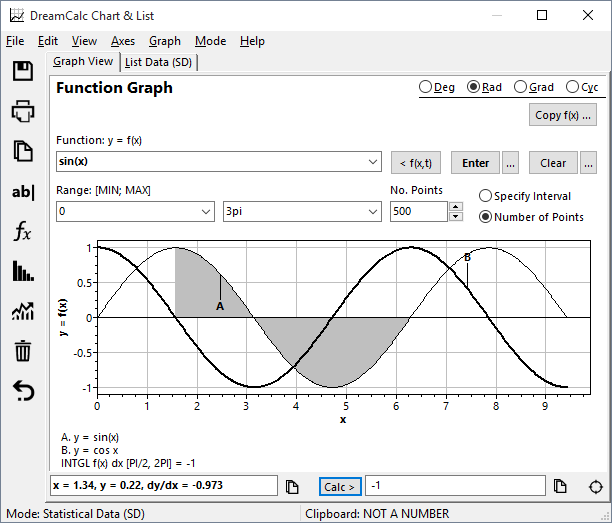 In such cases, DreamCalc will display a small warning message in the graphing area to indicate that not all points were generated, but otherwise the plot will be shown as normal. Generally plots will be generated instantly. However, lengthy functions and/or a high number of data points may cause DreamCalc to timeout, generating only a partial plot over the desired input range. By default, DreamCalc will timeout on graphing operations after approximately 5 seconds. You can increase this in Options Window by setting the Timeout option to a value greater than this.